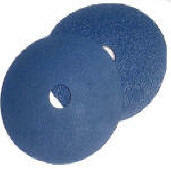 Resin fiber discs are used on right angle grinders for sanding and weld smoothing. Use with a backup pad that is the same diameter as the disc. Aluminum Oxide for general purpose metal use. Silicon Carbide for granite, marble, concrete, etc. Alumina zirconia resin fiber discs are a premium grain for metalworking application. They are the best disc for stainless steel applications. Use on right angle grinders for sanding and weld smoothing. All Kasco resin fiber discs are available to purchase by the box of 25 or by the case of 100. Purchase by the case and save an average 10%. Click on either the box or case link to go to the shopping cart list.